Liar's Retreat is an underground cellar which is located northwest of Broken Tower Redoubt and northeast of Karthwasten. Apparently, until very recently this used to be the site of a bandit bar run by a Breton named Rahd, who is known as 'Longhammer', due to a unique weapon he carries. Falmer have tunneled in and are attacking the last of the occupants when you arrive for the first time. Liar's Retreat: Retrieve the Longhammer from a fallen bandit. The entrance is marked by a cairn. Two lit braziers are on either side of an unlocked wooden door that has been set into the rock face. Upon entering, there are stairs descending to a balcony overlooking the main bar area. You'll witness a raid of Falmer finishing off the last of the bandit residents. Descend the stairs to the main bar area to find everything in an uproar. Overturned tables and chairs, the corpses of bandits, a burnt corpse in the fire to the left, and blood and gore everywhere showing the ferocity of the attack. There are seven leveled Falmer, including two magic-users, in this area including one hidden in a bedroom and another in the kitchen, which can lead to a challenging fight for the unwary. The Falmer have tunneled their way from deeper nests which contain more Falmer, a chaurus, and some frostbite spiders. There are the bodies of six bandits including one that appears to be a bard still holding his lute and one behind the bar that appears to be acting as a serving girl. Around the room are two baked potatoes, a bulb of garlic, three seared slaughterfish steaks, two portions of grilled leeks, several loaves of bread and pieces of cheese. Against the southeast wall is a food barrel. A Falmer war axe has been chopped into the counter, while under it is a random bow, an iron sword, two leveled poisons, and a leveled potion of stamina. Behind the counter is a food barrel and along the rear wall are three sets of shelves and a cupboard. The cupboard only holds clutter, while the shelves hold two bottles of alto wine, two bottles of wine, a cabbage, a loaf of bread, two bottles of skooma, two food barrels, two mead barrels, and hanging from one of the shelves is a bunch of dried frost mirriam. From the northeast corridor you can hear a bandit that is still alive talking to himself. There are three bedrooms in this corridor; the first of these has a novice lock and has been barricaded by the bandit. He will immediately attack as soon as you open the door. The barricade is made up of many baskets and buckets. The room contains two unowned single beds, a table and chairs in the western corner, and an unlocked chest against the rear wall. A cupboard in the eastern corner holds a bottle of alto wine, a bottle of wine, a pair of random gauntlets, and a random potion of magicka. By the foot of one of the beds is a pair of leather boots, and one of the baskets contains a cabbage, a bulb of garlic, and a piece of bread. On the table is a medium coin purse and five loose septims. The middle bedroom contains a Falmer, unless they joined the fight in the main bar area. It appears to be a communal room containing six beds, two of which are now unusable. The bodies of another three bandits can be found in this room and along the rear wall are three bookcases containing seven common books, many ruined books, a flute, a drum, a random war axe, and on top of the last of these is a cow hide. On the floor are another couple of common books and a random greatsword as well as plenty of blood and gore. The last bedroom has also been partially trashed by the Falmer with a bookcase knocked over and clutter spread over the floor with a couple of common books among the carnage. There is an unowned single bed in the eastern corner, an adept-locked chest against the rear wall and a long wooden table by the door with a random potion of healing and three common books on top. At the foot of the bed is a pair of fine boots and under it is a potion of vigor, which can be most easily retrieved with the use of telekinesis. A stone shelf on the far side of the room holds a copy of the Speech skill book Biography of the Wolf Queen, along with a helmet and several potions. Behind the bar in the main room, a hole in the wall leads to the kitchen where another Falmer waits unless it has also been alerted by the fighting and converged on you. The kitchen area contains a sideboard against the northwest wall with a table beside it coming out from the wall. There are four bottles of Nord mead, a random potion of healing, and a random battleaxe on top. Against the northeast wall is a large fireplace with a cooking spit in front, while on the right-hand side of the hearth is a woodcutter's axe leaning against a pile of firewood, and a small coin purse hidden behind an empty bucket in the corner (see bugs). Along the southeast wall, there is a sideboard with two salt piles on top, and a set of shelves to the right holding two rock warbler eggs, a spider egg, four carrots and another woodcutter's axe. In front of this on the floor is a cast iron pot containing a slaughterfish egg, two carrots, and a bulb of garlic. In the southern corner is a brewing vat with a cupboard and set of shelves to the right, along the southwest wall; they hold two potatoes and some cheese. Overhead, hanging from two beams are three bunches of dried elves ear, four salmon, a garlic braid and a rabbit, while in the middle of the room is a table with a baked potato, a raw rabbit leg, a fillet of salmon meat, a piece of cheese, and a red mountain flower on top. The kitchen also connects to the corridor with the three bedrooms via a wooden door in the northwest wall. As you pass through the door to the northwest there is the hole where the Falmer broke through to mount the attack; ahead is the fire from a dropped torch beside the body of another dead bandit. The tunnel takes a couple of turns and passes a glowing mushroom growing on the wall, before opening out into a cavern covered with spiderwebs. There is a frostbite spider by the entrance, with a Falmer off to the right that will investigate any fighting. A couple more spiders may drop from the ceiling, as well. Around the corner, to the southwest, is a Falmer tent containing an apprentice-locked Falmer chest and a random potion of healing. Next to this is a narrow tunnel that twists and turns with several chaurus egg sacs, numerous glowing mushrooms, and several types of fungi growing in patches throughout. At the end of the tunnel is a leveled Falmer waiting on a ledge. Beyond is a ramp heading up and to the west, with a dormant Falmer hive on the wall to the right. There are two corundom ore veins at the base of the ramp. However, mining these before clearing the cave system will alert several Falmer and a bandit to your presence. There is a glowing mushroom, a bleeding crown fungus, a human heart, a random potion, and a random poison scattered on the ground by the ore veins. As you climb the ramp there is a rock on the left, by a pillar, with a random potion of healing, two skeever tails, a Falmer ear, and another bleeding crown fungus on top. To the right is an unlocked Falmer chest with a random potion of healing beside it. At the top of the ramp the path descends again to the northwest to an area with a leveled Falmer and two pens. Each pen contains the body of a dead bandit, while the pen on the right also has a living bandit trapped inside. As the path starts to rise to the north there is another leveled Falmer standing guard with two more nearby that can easily be alerted by any fighting. There is a third corundum ore vein on the left where the path turns to the east. As you descend there is some carved stonework on the left and a Dwemer piston is pumping above. 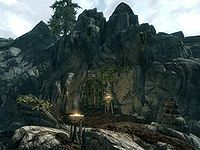 As the path turns back to the northeast there is an open Falmer gate leading into a large circular cave, partially fenced in with Dwemer metal work. A leveled chaurus off to the right and a Falmer tent with a leveled Falmer standing inside is to the left. In the center of the room, on an altar, is the body of a Breton named Rahd. Next to him, or slightly underneath the altar, is The Longhammer, a unique warhammer notable for its 30% faster swing speed. In the rear are two more Falmer tents. An unlocked Dwemer chest is next to the tent on the left, hidden among some vegetation. The tent on the right has a Falmer bow on the ground. On the north wall, there is a flat rock with a Falmer shield, a Falmer bow, two skeever tails and three glowing mushroom samples next to the body of a dead chaurus. There is an unlocked Falmer chest to the right and three loose chaurus eggs on the ground. Behind the Dwemer fence is an area full of chaurus egg sacs and the gory remains of a human. A ramp is also behind the fencing, leading up to a fourth Falmer tent. There is no shortcut back to the bar, so you need to retrace your steps. When you leave the tunnels, returning to the bar area after clearing it, you will be confronted by some aggressive bandits that are just entering the bar. Among them is a bandit chief who remarks, "Hey, Longhammer, set us up with a round of... what in Oblivion happened in here? ", indicating that Rahd was probably the barkeep of the establishment before the Falmer attack. There is an additional corundum ore vein outside the cave to the south down the cliff. While the Falmer will respawn, the bandits will not. You may not be able to interact with the coin purse in the kitchen. The hammer may be under the table, not on it. It also may have fallen off the table, and be near the gate through which you entered the room. If you clear the dungeon without taking the Longhammer, it will be repopulated with Falmer, but the warhammer and Rahd's body may be missing. This page was last modified on 12 April 2017, at 04:53.